Immaculée Ilibagiza was born in Rwanda and studied Electronic and Mechanical Engineering at the National University of Rwanda. Her life was transformed dramatically in 1994 during the Rwanda genocide when she and seven other women huddled silently together in a cramped bathroom of a local pastor’s house for 91 days! During this horrific ordeal, Immaculée lost most of her family, but she survived to share the story and her miraculous transition into forgiveness and a profound relationship with God. Her book about this experience, Left to Tell, has sold more than 250,000 copies worldwide, and has been made into a documentary. 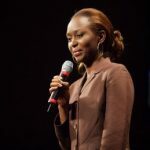 Four years after the Rwandan tragedy, Immaculée immigrated to the United States and began working for the United Nations in New York City. She has since established the Left to Tell Charitable Fund to help others heal from the long-term effects of genocide and war. Tony Melendez was born without arms in 1962 as a result of his mother taking the prescription drug, Thalidimide. He may have been born without arms, but that didn’t stop him from dancing, dating, playing the guitar and enjoying life to the fullest. Today, Tony is known around the world for playing the guitar with his feet. 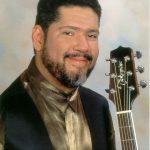 In 1985,Tony began playing and singing in the Los Angeles area. Just two years later, his life was changed forever when he performed for Pope John Paul II before a live audience of 6,000 people and a TV audience of millions. Tony has won Unity Awards Male Vocalist of the Year in 2000, 2002, 2004 and in 2002 took Artist of the year. He received the Branson Entertainment Award for Best New Artist in 1999, the “Inspirational Hero Award from the NFL Alumni Association” at Super Bowl XXIII, and has received special commendations from the State of California for his work with young people and from President Reagan, regarding Tony “as a positive role model for America.” Tony and his wife Lynn live with their daughter Marisa in Branson Missouri. Tim Staples is Director of Apologetics and Evangelization for Catholic Answers in El Cajon, CA, but he was not always Catholic. Tim was raised a Southern Baptist. 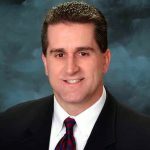 Although he fell away from the faith of his childhood, Tim came back to faith in Christ during his late teen years through the witness of Christian televangelists. Soon after, Tim joined the Marine Corps. During his four-year tour, he became involved in ministry with various Assemblies of God communities. Tim, however, met a Marine who really knew his faith and challenged him to study Catholicism from Catholic and historical sources. That encounter sparked a two-year search for the truth that led him to the last place he thought he would ever end up: the Catholic Church. Tim has helped thousands of people find their way home to the Catholic Church. 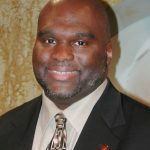 He currently resides in Southern California with his wife Valerie and their infant son, Tim Jr.
Deacon Harold Burke-Sivers is the Founder and Director of DynamicDeacon.com, a Christian evangelization and apologetics organization dedicated to the dissemination and promotion of Catholic values, principles, and teaching in complete faithfulness and total submission to Holy Scripture, Sacred Tradition, and the Magisterium. The goal of his apostolate is to bring as many people as possible to a deeper love of Christ and the Gospel by sharing the truth of the Catholic faith in love. Deacon Harold is President of Servant Enterprises, a non-profit organization that hosts an international institute for Catholic male spirituality, coordinates dynamic speaking tours and life-changing retreats, and develops products and services that support family life. Most importantly, Deacon Harold is married to his wife Colleen and they have four beautiful children. 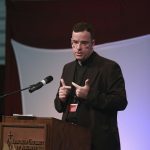 Father J. Brian Bransfield is a priest of the Archdiocese of Philadelphia, and is the Associate General Secretary of the U.S. Conference of Catholic Bishops. He received his doctorate in moral theology from the Pontifical John Paul II Institute for Studies on Marriage and Family. He previously served as Professor of Moral Theology at St. Charles Borromeo Seminary in Philadelphia. He is the author of the best-selling book, The Human Person: According to John Paul II. In his latest book, Living the Beatitudes: A Journey to Life in Christ, Fr. Bransfield addresses the essential question, “What does it mean to pass beyond fear and live our faith every day?” He explores this question by drawing on the account of the Beatitudes from the Gospel of St. Matthew, and the anonymous Samaritan woman at the well from the Gospel of St. John as someone whose experiences of being lost, misdirected and searching are reflected in many people’s daily lives.